Description: Preorder DVD containing a live performance by 50 Cent from his "No Fear, No Mercy" European concert tour. 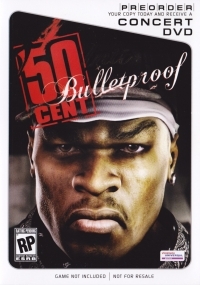 This is a list of VGCollect users who have 50 Cent: Bulletproof Preorder Concert DVD in their Collection. This is a list of VGCollect users who have 50 Cent: Bulletproof Preorder Concert DVD in their Sell List. This is a list of VGCollect users who have 50 Cent: Bulletproof Preorder Concert DVD in their Wish List.